Its easy to forget that rules still apply on vacation. After all, who wants to think about rules when its way more fun to think about catching a wave, boiling shrimp, or fishing off the back of a boat? Luckily, Edisto is the type of place where it is easy to kick back and relax without having to worry much about any sort of crime or hassle, but there are a few rules set by the town that first-timers and regulars should keep in mind when they get behind the wheel. To begin with, the speed limit on Jungle Road is 30 mph and 35 mph on Palmetto Boulevard. Last year, there were 150 traffic warnings and 14 golf cart violations issued during the month of July. Its also important to remember to wear seatbelts and not bring along any alcoholic beverages. Checkpoints are set up from time to time, especially during holiday weekends, and nobody wants to come home from vacation with a ticket for driving under the influence as a souvenir. These rules also apply to all those who drive golf carts. Golf carts are only allowed on Jungle Road and side streets and can be operated within a two-mile radius of the drivers residence. They can be used to cross Palmetto Boulevard to get to the beach, arent allowed to travel on Palmetto Boulevard (or the beach). Golf cart drivers must have a valid license and be 16 years of age or older. Passengers are not allowed to dangle from the cart, stand on it, or overcrowd a cart. All rules of the road must be obeyed and drivers should be aware of the bicyclists and pedestrians on the bike paths. 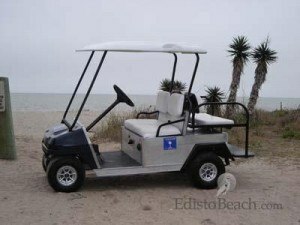 Golf carts are not allowed to be operated after dark and must use headlights during dawn and dusk. Open container law also applies to golf cart drivers and passengers. In addition, drivers should be aware of the abundant wildlife in the area that seemingly comes out of nowhere. Deer, possums, raccoons, stray cats and dogs, squirrels, frogs, and even crabs and baby sea turtles can be found on just about every road in town. Its a good idea to keep it slow and keep an eye out for these animals, especially the deer, for everyones safety. Keeping it slow and paying attention to the road ensures everyone has a safe and happy vacation.